Arpádhon - Hungarian Settlement, Louisiana claims to be the largest rural Hungarian Settlement in the United States today. In an effort to preserve our history, we have established the Hungarian Settlement Museum in Albany, Louisiana. 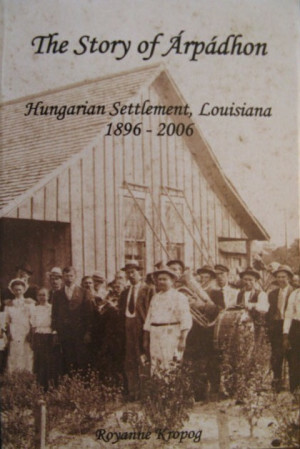 The museum is located in the old Hungarian school in "Hungarian Settlement" Louisiana. With the generous help of donations from the community, as well as some grant funding, we are on our way to restoring the school building to its original beauty. The first phase of the museum renovation is completed. However, we need additional funds to complete phase two. Our goals are to raise funds and membership to aid in the phase two project. Donations to our project are greatly appreciated. All donations will be used for the restoration project, and are tax exempt. In addition, a person or business may wish to sponsor one or more of the many beautiful case displays. Case sponsorship is $100 or $150 per year, depending on the case being sponsored. The sponsor's name will be placed on each case sponsored. Anyone interested in sponsoring a display case should contact 225-294-5732. Donations can be made to Hungarian Settlement Historical Society (or HSHS) and mailed to P.O. Box 1909 Albany, LA 70711. We also accept credit card donations through PayPal. Click the "Donate" button below to get started. We thank you in advance for your contribution, and hope to see you at the museum soon. At the turn of the century, when our country was still young, Hungarians came to south Louisiana in search of a better life for themselves and their families. Land was purchased and cleared by hand. Through adversity and hardship, and a cash crop called strawberries, they carved out an existence and thrived. The result is Hungarian Settlement -- the largest rural Hungarian Settlement in the United States today. Royanne Kropog, a native of Livingston, Louisiana, has lived near Springfield, Louisiana, with her husband Alex Kropog, for over 30 years. She graduated from Southeastern Louisiana University in Hammond, Louisiana. She retired as an educator having taught math at Kenilworth Junior High School in Baton Rouge, Louisiana. She is active in the Hungarian Settlement Historical Society where she is known as its historian and is the "Temporary" Curator of the Hungarian Settlement Historical Museum in Albany, LA. In her spare time, she loves to read and to play her musical instruments: dulcimers, mandolin, violin, bowed psaltery and bouzouki. $20.00 for softback, $25.00 hardback; add $3.50 per book for shipping and handling in the U.S. For International Orders, please call (225) 294-5732. We accept money order and personal checks. Use the form on the Store page to indicate whether you would like to order hardback or softback. You can also mail your request, along with a personal check or money order made payable to "Hungarian Settlement Historical Society." Please mail you check and/or your order information to Royanne Kropog at 30165 George White Rd., Holden, LA 70744. Books will be shipped as soon as check clears. CLICK HERE to view this item on our store page.